Win yourself a royal treasure with the “Triple Fortune Dragon” slots. This amazing game has five reels and two hundred and forty-three possible paylines. The coin values are as small as one penny each, but can also go as high as five dollars apiece. With so many paylines this can easily be a very rewarding penny slots experience, or it can be a high risk venture with enormous payouts. The game includes wild and scatter symbols as well as some bonus opportunities too. The symbols used to illustrate the Asian theme include the golden dragon, gold coin, Emperor, girl, vase, fan, and the A, K, Q, J, 10 and 9 symbols. 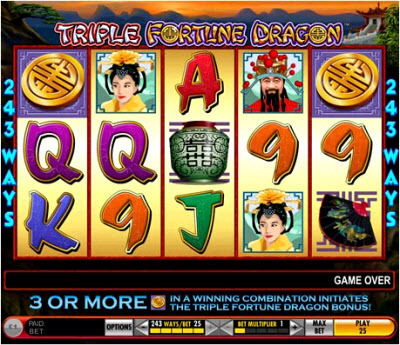 The wild symbol for all games of “Triple Fortune Dragon” slots is the golden dragon and it will substitute itself for all symbols (except the scatter) in order to make a winning combination complete. This symbol is limited to reels two and four, and it must fall along the activated payline, but when it does the prizes are multiplied. 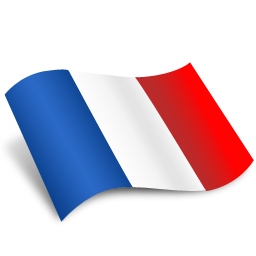 For one wild symbol the prize is tripled, and for two or more the prize is multiplied by nine times the amount. The scatter symbol for this game is the gold coin and it will also complete winning combinations. The scatter does not have to hit the active paylines to qualify for the win, but it does have to appear in consecutive order from left to right. Payments for scatter bonuses are determined by the number received in the win. When it is five scatters that complete a combination the player gets a fifty times multiplier applied to their original wager, when it is four the multiplier is twenty, and when it is three the bet is multiplied five times. For all games of “Triple Fortune Dragon” slots the prizes are determined by the number of matching icons falling along one of the many paylines. When there are five symbols on the payline the player receives one thousand coins in the amount wagered for the emperor or the girl, five hundred for the vase or the fan, two hundred for the Ace or the King, and one hundred for the Queen, Jack, 10 or the 9. When there are four symbols on the payline, the prizes are four hundred for the emperor or the girl, two hundred for the vase, one hundred for the fan or the Ace, fifty for the King, and twenty-five for the Queen, Jack, 10 or the 9. The three symbol combinations payout one hundred coins in the amount wagered for the emperor, fifty for the girl, twenty-five for the vase or the fan, and ten for the Ace, King, Queen, Jack, 10 or the 9. The 10 and 9 symbols also have a reward for two on the payline, with each giving the player five coins in the amount wagered.